Let’s face it, there are some restaurants that a diner can’t help but enter with high expectations. 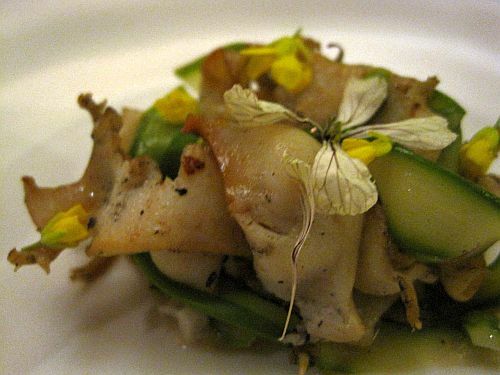 Many of these restaurants live up to said expectations; a select few exceed them. Then, once in a blue moon, you stumble upon a restaurant that doesn’t just go above and beyond, doesn’t just become another entry in the book of memorable meals, but redefines your concept of food. Coi is one of those restaurants. While many food critics often use exaggerated declarations to impress the good qualities of a restaurant on a reader, I do realize the intensity of that last statement – and fully believe it. 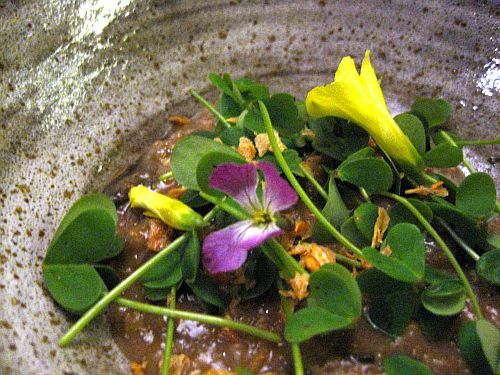 For even the most experienced diner, a restaurant that truly reinvents fine dining by challenging the idea of what is considered food, or how ingredients can be expressed on the plate, is not often encountered. And even when such innovation is met, it’s not necessarily tasty. 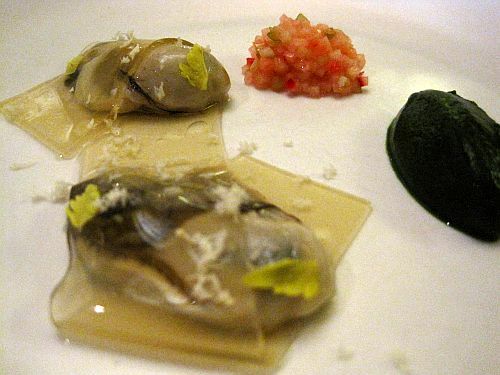 Not only did Chef Patterson’s exceptionally thoughtful menu live up to my expectations of a 2-star Michelin-rated restaurant (a rating that is, frankly, too low), but it also introduced me to flavors that have never before been on my palate by finding new ways to engage my senses. 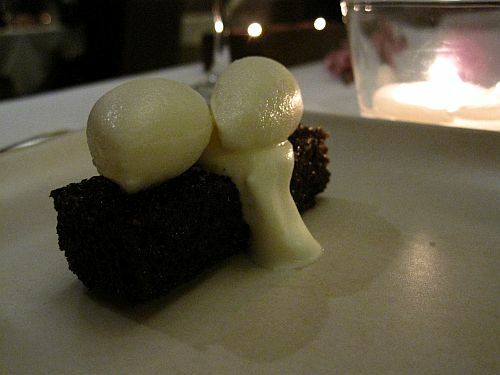 While every dish of my 12-course meal was impressive in its own right, describing each in detail would be excessive. 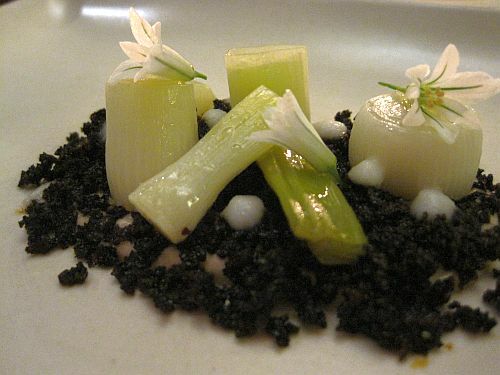 However, there are certain dishes that cannot go unnoticed, starting with the “Calcots” - new onions served atop “smoke and spice” squid ink bread crumbs (padron and pedillo spiced), and a purée of Romesco, hazelnut, and almond. 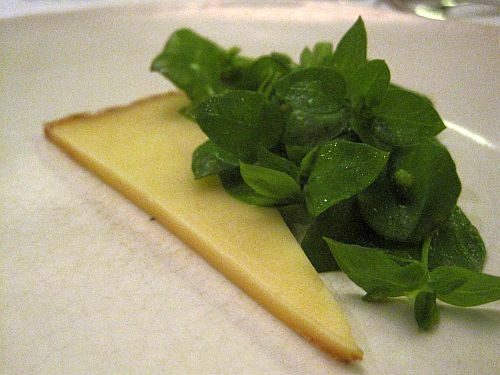 The beautiful, simple, garden-like plating of this dish contrasts the intricacy of its creation. 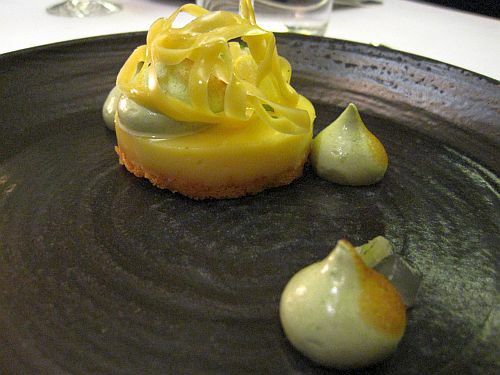 At the same time, that intricacy is remarked in the taste and texture while the simple, unique flavor of the onion is left unadulterated - a perfect representation of creativity, complexity, restraint, and sophistication. The dish that followed will forever remain in my memory: buttermilk Panna Cotta accompanied by cherry blossoms and budding shoots of wild fennel. First and foremost, the flavor was overwhelming - the buttermilk (a special culture acquired through their in-house butter-making process), infused with cured cherry blossoms, along with the hints of pickled and wild fennel was a perfect balance of delicate freshness and creamy richness. And, the aromatic qualities the cherry blossom twig, left on the plate purely to smell, transforms the flavor into something truly unique. 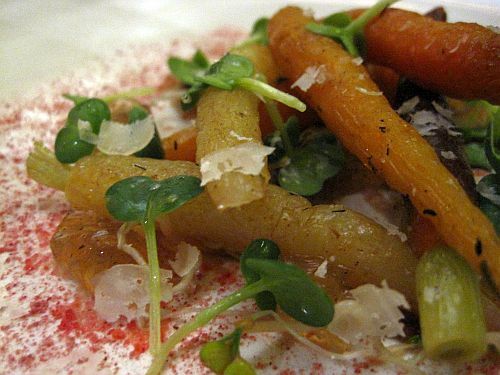 Finally, while the Young Carrots Roasted in Hay (though certainly impressive) was not my favorite dish of the meal, it embodies why Chef Patterson is revolutionizing fine-dining through his intellectual and creative approach to cuisine. First, Chef Patterson looks at a bundle of hay and says, “Yep, I have an idea for how I can use this.” Then, lightly charred and raw hay is cooked together in low-temperature water to create a hay-stock. This stock is then seasoned and set with agar – all of this to create one single, small element on the plate. The brilliance of this restaurant, while evidenced in the cuisine, is also seen in the extreme attention to detail in every aspect of the dining experience. The leaves casting shadows on the ceiling change to flowers in the spring to match the season, an itemized list detailing which farm provides each ingredient accompanies the menu, copies of the menu are set aside well before they are asked for, the timing of the service – from bringing bread to clearing the plate – is impeccable, and finally, the diner is encouraged to take a look inside the kitchen and speak to the chef. Finally, this review would not be complete without a note about the service. To describe it as welcoming would be a gross understatement – they know you’re going to be there for awhile, and do everything to make you feel comfortable. As I told to our waitress, not since the French Laundry have I experienced such well-seasoned, warm, downright impressive service. My experience can be summarized by its beginning and end. 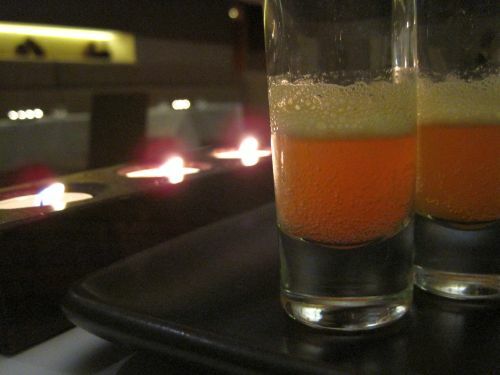 The meal opened with Firethorn berries, made into a soda with orange juice, lime, and simple syrup. 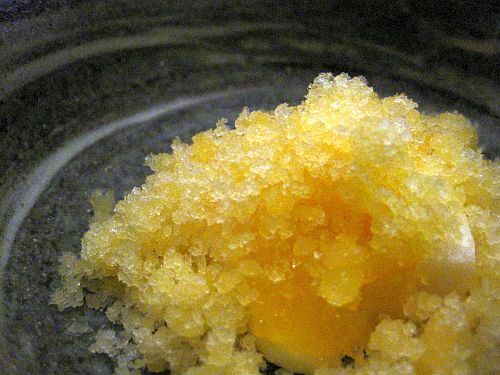 The meal concluded by taking the same ingredients, and transforming them into a sweet, fruit gelée. 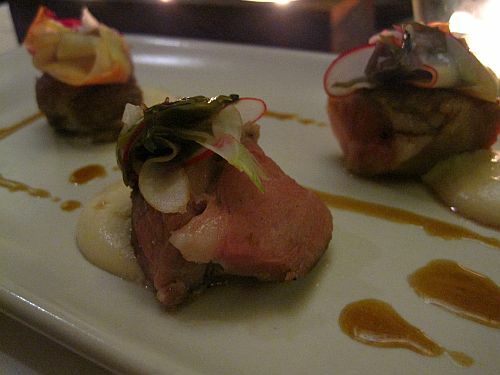 Novel in flavor, simple in composition, inventive in concept, and thoughtful in execution, these bites represent the characteristics which, for this reviewer, catapult Coi into the forefront of fine-dining.